accompanying VCD showing exercises also with minimal English/Chinese narration. The TaiYi Daoist Boxing style was developed in the Mt. Laoshan branch of Daoism. It is structured in two parts: Five Element Boxing and Five Animal Boxing. These integrate the boxing movements and health benefits. Among its forefathers is Zhang San Feng the legendary creator of Tai Chi Chuan. Though the movements are of the same Five Animals: Tiger, Dragon, Snake, Crane and Leopard; the movements and some of the theory differ. The five elements are not made to think of as “real” as much as characteristic. Water, for example, penetrates and descends. Dragon helps master “air” or qi and intent. Tiger helps sinews. Snake masters qi and vital energy. Crane is relaxed and sensitive. Leopard has fierce, determined energy which seems to come from the bones. The movements are much more relaxed than Shaolin with other forms that are almost entirely energetic. A different approach to many of these concepts. The martial half of the style is balanced with a deep investigation of health and longevity. In addition to the form and accompanying VCD, the normal photos of an instruction book are supplanted with charming ink drawings of the proper techniques. C. S. Tang is not only a teacher and a writer but also a lineage holder in the Xing Yi universe. This might indeed be the most “complete" source to date. After all, here is a text detailing Xing Yi history, notes on basics, our beloved “tips and songs,” photographic form instruction for routines such as Five Element, 12 Animals, Evolving Form, Zha Zhi, Destructing Form, Two-person Drills, and weapons including those wielding all of the Four Grandparents. An extra bonus lies in the dedication; Tang outlays the WHOLE Xing Yi story (including the Song XY Clan) with its many branches and teachers, sacrifices and daring escapes. The book is peppered with invaluable aids including notes, songs, aphorisms and a lifetime’s gathering of not only theory but insight. Many is the time when a practice of some technique opens up because a simple saying shows the way. This is a book like that. Decent photos and a lot of them. 161 pages, English/Chinese text, softbound, oversized with photographs. The two most famous and practiced forms of Xing Yi are demonstrated and deconstructed here. The English/Chinese text is detailed, clearly written and sophisticated. Because Xing Yi is based on single, repeated actions at first this gives an unusual opportunity to give information in layers, covering many details and technicalities not often found in written form. The first form is the crucial Five Elements pattern. Next is a “mixed” form with the five elements “linked” together in different patterns. In addition, there are some good translations of principles and mechanics. Sometimes a line, even in translation, can be a portal to new levels of skill. Most martial artists who have been around for a while have experienced this. Good big and clear photography with a clean layout. In discussing the elemental nature of Xing Yi and the element theory itself, there is some chance for metaphor and poetry, often learning aids that act in their own special manner. This is a teasure trove of the art of Li Yulin through his son, Li Tianji and the capable hands of Andrea Falk. The instruction of the forms such as the Five Elements and the Twelve Shapes is accompanied by back detailed explanations on these practice methods. "Don't underestimate the chicken just because it is one of the more mundane animals in the list. I spent way too much time playing with them in China, and found them to have an extraordinarily fast, powerful, and accurate attack." Solo Forms: the famous ZhShiChui and others. them out yourself. Dozens of classic instructions and codes. Andrea Falk is a dedicated teacher of Xing Yi and Bagua. She has also contributed to the art by a number of translations in clear and straight forward books. She is a teacher of the Ma Gui style of Bagua Zhang. There is almost nothing in English on the Dai Family style of Xin Yi. This book approaches the subject from the specialty of Daoist arts. If you have seen this fist demonstrated you will immediately note the unusual angles and postures. This is explained by the correlation between Dai family Xin Yi practice and Daoist alchemical tradition. Every posture and attitude has a Daoist interpretation. In this book the aspect known as Internal Alchemy counts for much more than the applications, though they are also described. 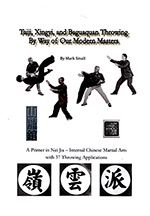 Even if you are already familiar with Xing Yi this book will show you a style rarely seen. Dai style is well known for its odd starting postures and elegant finish postures. The elements look different and are expressed differently. This presentation of the material may be the area where meditation and movement meet. For instance, all the basics of Xing Yi are covered but the elemental forms are divided into yin and yang and emphasize quiet training. In addition there is a section on the Eight Trigrams with each primary change showing a special exercise or Gong. Hun Yun and Dragon body standing are further illuminated. The subtitle gives the hint: "Heart-Mind—The Dao of Martial Arts." Be prepared for a Daoist journey. Images of each posture  Songs and images of the five elements  the guidelines for practice contained in Xing Yi's "Seven Words"  Essential points of the Six Harmonies and the extremities  Historical notes and biographies..."
I called this "a decent translation" on the art of Xing Yi when it first came out. Since then Mr. Groschwitz has obtained a fuller edition and added information never before available in English. Many books have the typical "head erect" and "six harmonies" explanations. But this reaches beyond most texts; no one goes to the trouble of translating a book like this because they feel it's unimportant. The many biographical notes alone, make this essential to a well rounded Xing Yi library. Also the inclusion of the original Chinese is a plus. Groschwitz's translation is even better than in the earlier edition. To be honest, many of the writings on Kung Fu from the Qing period are not really as important as they are made out to be. This is the shift from experiential to academic but with solid information back by life long practitioners. See this in the collector's Chinese reprint series. 295 pages, English, softbound, oversized with photographs. Xing Yi is a great style for many reasons. There is nothing quite like the interplay of motion and stillness, or the clarity of the Elements. This book is best suited to the student of XY who wants to delve into the finer points. It has an entire section on the writings and teachings of the masters with some textural analysis among sources. This thorough and scholarly approach is repeated when a section is reserved for discussing XY weapons and which "are" and which "aren't" original to the style. All four of the XY grandparent weapons (which I call the "four esses"—spear, sword, saber and staff) are shown with detailed key points and breakdown. I would have liked to see pictures bigger but I always want to see bigger pictures even in my own books. A major text, one might say a document, on the art of the Five Phases. Worth the money. This is an English edition of a major Chinese text on Xing Yi Boxing. Li Wen-Bin, a well-known teacher, studied under Grandmaster Shang Yun-Xiang. 166 pages, English/Chinese text, softbound, oversized with photographs. Various prefaces by Li Gui Chang, Song Zhi Yong, Tom Bisio and Valerie Ghent; also an interview on this method of Xing Yi Qi Gong with Song Zhi Yong himself. In addition, Tom Bisio has provided free videos of the four key nei gong sequences. Video reference for the book can be found at http://www.internalartsinternational.com/tu-na-si-ba-videos/. 146 pages, English/Chinese text, illustrations and accompanying VCD showing exercises also with minimal English/Chinese narration. XingYi developed in the later Ming dynasty has had a strong effect on Chinese Martial Arts. It is a well-structured style based essentially on Five Elements and Twelve Animals. The Five Elements Boxing shown here is so fundamental it is called the Mother Boxing. The Twelve Animals add not only variation but angular changes and even the predatory aspects of the animal qualities. The demonstration in the book is clear and simple, the one on the VCD is Teacher Li SuLing, the editor of the entire masters series. Note: We have been successful in playing these VCDs using a few different programs—such as VLC and Quicktime—but no one specific app. They also have worked on our stand-alone DVD player. This takes its basis from Huang Po Nien's famous "Xing Yi and Weapon Instruction" which, in chapter three, contains the first attempt in writing to apply Chinese martial methods to modern military weapons. 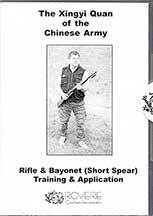 It is in this book that Xing Yi is applied to bayonet practice. The author of this book takes this as a beginning. His own experience includes teaching military units, and operating in high threat environments and war zones. He was trained by Colonel Chang Hsiang Wu a former chief instructor of military strategy and Xing Yi at Whampoa Central Military Academy. THIS VOLUME contains translation of Huang original instructions, Rovere's demonstration of the technique a nice section of the original Xing Yi Spear techniques with somewhat restored photographs. All this and a DVD demonstrating the applications of the bayonet techniques. Also there are interesting notes on the entire structuring of Chinese techniques to meet modern needs and threats such as the Japanese invasion. 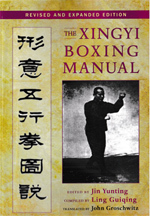 Sun Lu Tang's treatise o n Xing Yi Boxing was published in 1915. His first book it is said to be the first text published publicly in China to integrate the theories of martial arts with Chinese philosophy and Taoist Ch'i cultivation. This started the designation of martial arts into the so-called "internal" schools which some have applauded and some deeply regretted. Nonetheless this is a true classic. This translation has detailed instructions on the Five Mother Fists and the Twelve Animal motions along with a linking set. Mr. Miller has done a service to English speaking students of Xing Yi by producing this work. Included are a detailed biography of Sun and an interview with his daughter Sun Jian Yun. Click for collector's Chinese language reprint. Drawing on information from Zhang Bao Yang, Wang Ji Wu and He Yu Qi all students of Wang Ji Wu; Miller and Cartmell have created a text based on Xing Yi but geared toward Nei Gong (Internal Training). Few people today realize that "Chi Kung" is a neologism referring to what has generally been termed Nei Gong for centuries. In other words "Breath work" was always called "Internal Work". What's the diff ? Nei Gong implies a greater discipline, more power and most importantly a more rigorous application of the principles with more formal structure. Chi Kung implies a watered down version one might teach one's grandmother if she's had no previous training. There is a place for either but, with the sudden popularity of "Chi Kung" it is refreshing to see this admittedly technical but basically sound text on the subject from a Xing Yi Boxing standpoint. Health and Strengthening Exercises from Xing Yi. Take a look at Tim Cartmell's DVD of this series. This book is very straight forward and cocked full of information. While the text is bare bones it has the advantage of everything being en face, that is to say English and traditional Chinese side by side. A number of forms are covered including Five Elements, 12 Animals, The Famous AN SHEN PAO Duet, Mutual Restraint Duet and the less common Three Hand Pao. Cut out photos floating on the page give the presentation a 70's look. No history, just instruction. Demonstrations of the movements is by Yeung Sin Kwan, a former Wushu coach in Suzhou.